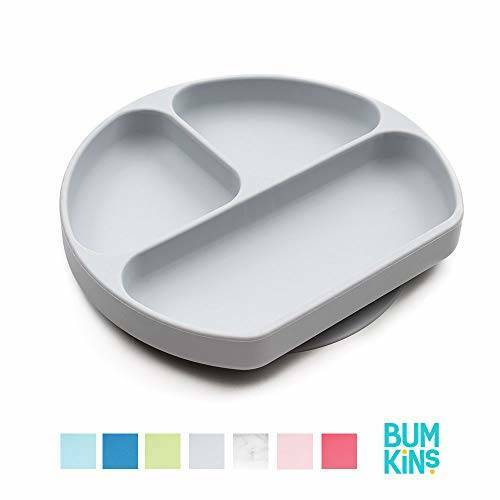 Bumkins Silicone Grip Dish is perfect for little ones learning to self-feed. The divided plate is perfectly sized for toddler portions. A strong suction base ensures the dish stays put – even with the most aggressive toddler! Great for use on highchair trays or tables. A straight side allows kids to belly up to the plate, allowing less of a mess. Silicone can withstand low and high temperatures, easily transitioning from the refrigerator or freezer to the oven or microwave. Made with 100% food grade silicone that’s durable, stain and bacteria resistant. Plus, it’s BPA-free, PVC-free, phthalate-free and lead-free. Oven safe up to 375°F. Dishwasher-safe (top rack). For ages 6 months and up. Measures approximately 8” across, 7” tall and 1” deep. Designed in Arizona, responsibly made in China. SELF FEEDING – Our Silicone Grip Dish is perfect for little ones learning to self-feed. The divided plate is perfectly sized for toddler portions. A strong suction base ensures the dish stays put – even with the most aggressive toddler. Great for use on highchair trays or tables. A straight side allows kids to belly up to the plate, allowing less of a mess. SAFE TO USE – Silicone does not contain any petroleum-based plastics or toxic chemicals like those found in plastics. Our grip dishes are made from 100% food grade silicone, are BPA-free, PVC-free, phthalate-free and lead-free. CONVENIENT – Silicone can withstand low and high temperatures, easily transitioning from the refrigerator or freezer to the oven or microwave. Oven safe up to 375°F. Top-rack dishwasher-safe. BACTERIA RESISTANT – Silicone has a natural resistance to bacteria, making it safe and hygienic. DURABLE – Silicone does not warp or damage and can withstand both hot and cold temperatures. It is also resistant to age, sunlight, moisture and chemicals.